Just for kicks and giggles, I thought it’d be a fun way to celebrate Halloween with a little lunch! 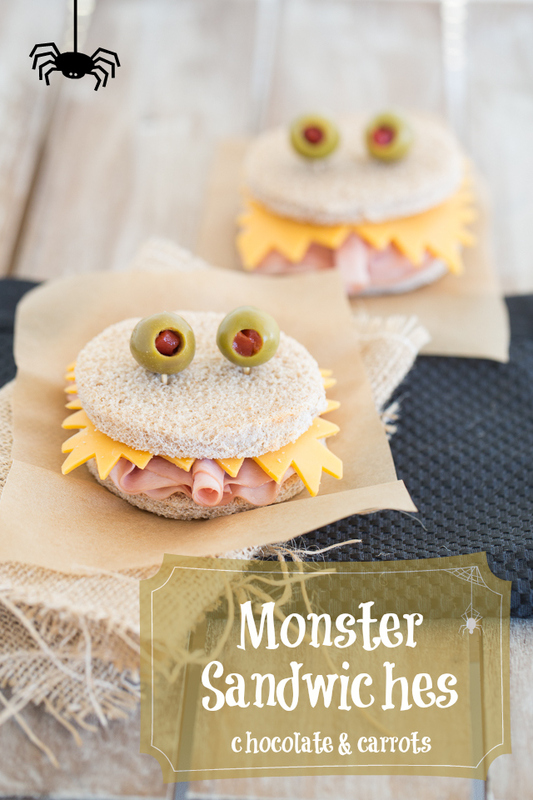 If you’d like the detailed instructions of how to make these adorable Monster Sandwiches, head over to Land O’Moms! Caroline, these are just so fun and perfect for kids lunch! Loving all your cute Hallowe’en recipes! This one’s adorable! Caroline, you are too darn cute!! Too cute for words!!! How creative! I love the ‘eyes’!! Thank you Amanda! 😀 Liam that it was funny…kid approved, right? Oh, I love these 🙂 so adorable! So creative! I bet this would make any kid eat olives! Oh my gosh! These are stinkin’ cute. Even my picky grandson would eat this because it’s awesome!! Haha…I bet! 😀 Thank you Kathleen! Oh my these are too cute!! My lil guys would love them! How cute are these?!?! I’m pretty sure my little dude would be a huge fan! I love it! The cutest monsters ever! Pingback: 8 eerily easy Halloween school lunch ideas. You can do these, we promise.